What if most people have it wrong, and miracles are not the exception but the norm? Flash's Song is the true account of how one person discovered the secret of miracles. It is a story of the power of laughter, the power of family, and, ultimately, the power of love to get us through life. Freelance writer Kay Pfaltz was living a quiet, simple life with her three beloved dogs when suddenly her life turns upside down. Coming to terms with a failed relationship, she must now take her ailing dachshund, Flash, in for back surgery. But when the vet tells Kay that Flash's problem is not a disc but in fact a tumor growing on his spine and Flash has, at most, three weeks to live, Kay is devastated. From here begins a journey of self-discovery and recovery that will open Kay's heart to the greatest miracle of all. Flash's Song tells the story of amazing canine courage and remission against all odds. It is a ballad of love and redemption, and a moving account of how Flash's three-week prognosis became five and a half miraculous months of learning, loving, and finally accepting. Written in luminous prose, accompanied by poignant photos, and filled with keen insight into love, faith, and the power of forgiveness, Flash's Song is not only a heartwarming ode to a little dog, but also a tribute to life and an invitation to cherish every moment of it. "I truly wish that I could have been a "Friend of Flash." Flash was unique & cool looking dachshund (or dash-hound as I like to say!) rescued by writer Kay Pfaltz. I'm a radio host and I just read Kay's beautiful new book, "Flash's Song: How One Small Dog Turned Into One Big Miracle" & allow me to tell you this most media (radio/TV) people don't have time to read all the books who's authors they interview. THIS book is so good that I'm reading it cover to cover! There are some real "life lessons" in "Flash's Song." In other words, a lot of stuff that I didn't know & I'm the Puffman! While coming to terms with a failed relationship, Kay had to take her ailing Flash in for back surgery, which led to the discovery of a growing cancerous tumor on his spine. She was devastated when the vet told her Flash had, at most, 3 weeks to live. One of the best books I've ever read. As "American's Veterinarian", Dr. Marty Becker barks, "This is a beautiful memoir, with insights into dogs, love & the intangible connection to all life that will keep you turning the pages & lift your heart." There are some real life-changing lessons in here & ways for all of us to bring miracles into our own lives. Looking forward to having Kay Pfaltz on the Puffman Show Friday afternoon. She's a big time writer, she's lived in France, & she loves animals. Life doesn't get any better than that. 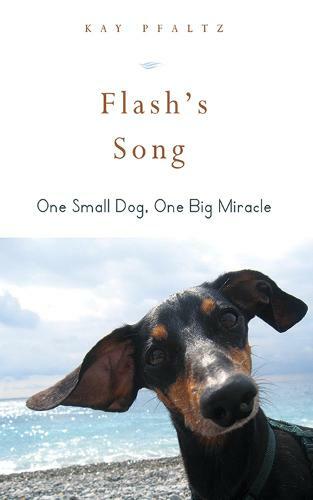 Look for "Flash's Song: How One Small Dog Turned Into One Big Miracle" at nationwide bookstores it really IS one of the best that I've read & all the beautiful pictures & prose about the late Flash will warm & break your heart! I wish that I could have been his friend ."